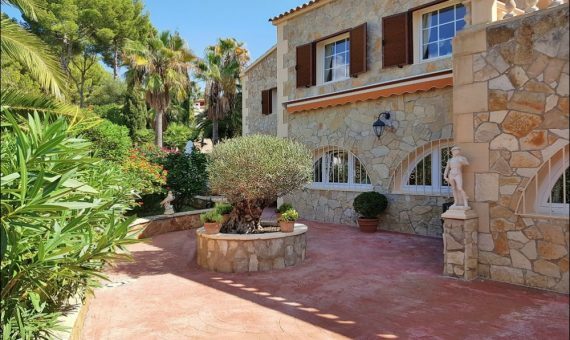 Amazing finca style house in a quiet area near the center of Santa Ponsa – luxury residential area as well as a widely known resort on the south west coast of Mallorca. The private plot of 1.100 sqm offers a beautiful area with a perfectly manicured garden, a swimming pool surrounded by a solarium with sunbeds and a covered porch with summer kitchen/bar with BBQ, dining table and lounge, and also parking spaces, and a garage for 2 cars. You can spend time with family and friends on several terraces, with lovely rest areas overlooking the garden and surrounding greenery. The stunning house in a modern Mediterranean style has got 387 sqm of the living area that is divided into a living room with a lounge area with fireplace and dining area, American spacious fully equipped kitchen, 3 bedrooms with bathrooms, a guest apartment with another bedroom and bathroom, and a cellar. Special attention was drawn to the stone facade, high ceilings, as well as a comfortable and bright layout, in order to create the atmosphere of an ideal family home, in which the modern and traditional style are exemplarily combined. The equipment includes air conditioners (cold / hot), underfloor heating, alarm, and video system. The villa is located a few minutes from the city center, which offers a combination of a charming promenade, excellent range of services, and sports facilities and an exclusive marina for luxury yachts Port Adriano with designer boutiques, various bars and restaurants is located 5 minutes drive by car.